I'm so excited about the start of something that I've been wanting to do for quite some time now, launching my very own Wedding Planning company. I'm thrilled to annouce that the budding of that dream has finally begun. I am slowly but surely starting this and I am over the moon to share that with you. Blush & Bloom Planning is now a part of my blog! I planned a friend's wedding back in May and that's when the journey began. I realized that this could be something I do on weekends while still going to school and it would propel me into the corporation I hope to own one day. I absolutely love how things have fallen into place. So my blooming for this month is the perfect timing of this dream that is slowly unfolding before my eyes. Thank you, Lord!!! Such a blessing! That being said, please check out the page on my blog with my note to the bride and the name of my business and logo! Your comments on the logo would be so appreciated! 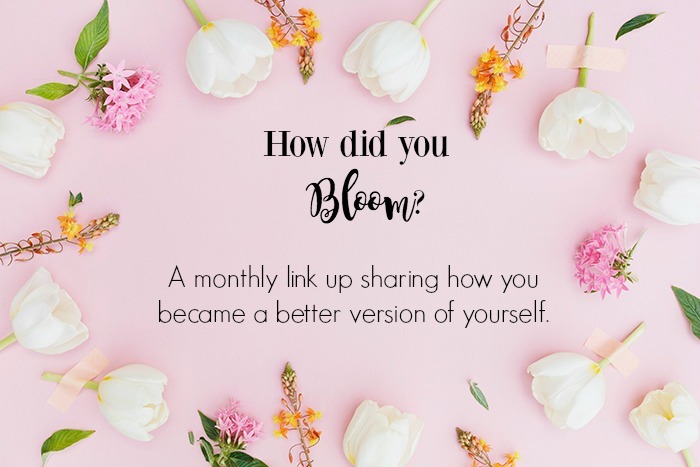 Also, I am changing up the monthly link up and adding spice to it for the next 6 months! For all the details, visit this page. I am super excited about it! I'm hoping with what I've planned it will give our posts more direction and make it fun to read what each other wrote! Lots of writing today and not a lot of pictures but I had lots to share! Thanks for listening!! I'm so excited for your business! Your going to do great!